China should ban the use, transport, and trade of ivory completely. But the reality is in 2009, China followed Japan, gained the importer status that can legally import ivory from South Africa, Botswana, Namibia, and Zimbabwe, which leave the possibility of illegal trading of ivory wide open. To counter it, African countries can raise the penalty of illegal trading and pressure Chinese government to tighten the custom inspection. Civilian education is also important. The practice of letting diplomatic staff members travelling without being subject to checkings is an anachronistic priviledge. Another point is that many Asiatic citizens/''businessmen'' resort to bribery to lure African poachers into killing these elephants and sell them the precious tusks. Still another point is that some countries' policy regarding wild life protection, and especially the elephants, is too ambiguous. They claim that because in some areas, the number of elephants is increasing too fast, their number need to be reduced. This exception is tantamount to leaving the door wide open to all sorts of abuses. But that’s also where it starts in China: the Chinese governement was obliged to acknowledge that from 1991 to 2002 it lost track of 121 tons of seized ivory and that is was probably illegally sold. 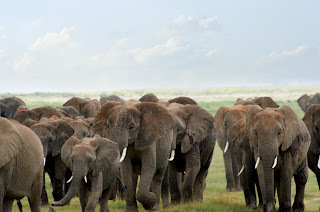 I’ve seen elephants in the wild, but never a herd of about 11.000 animals with 22.000 tusks! Wow @anonymous , Sounds really interesting your comment , is it true ? I felt helpless when I saw these tusks yesterday (Feb 7th, 2012) during my early shopping near the Jade Market in Hong Kong. I don't know if there's an authority to call? I took pictures of the storefront on Canton Road (near Jade Plaza). Feel ill. :( I read and loved Agony and Ivory. People have no clue.